If you are interested in the rich history of NYC parks, we urge you to attend an exhibition of photographs presented by the NYC Department of Parks and Recreation. Before They Were Parks, appearing at the Arsenal Gallery in Central Park (Fifth Avenue & 64th Street) through September 9, traces the evolution of some of NYC’s most iconic parks from their pre-park history to their contemporary use. The show features a blend of vintage pre-park images of the locations, transitional images of acquisition and development, and current images or plans of the parks as they exist now. 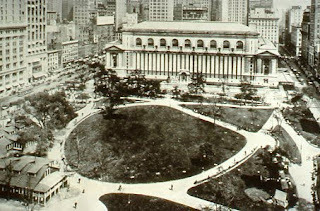 It’s a wonderful exhibition, not least because it includes some great vintage shots of Bryant Park. The exhibition, curated by Jonathan Kuhn, is located on the third floor of the Arsenal Gallery, and is open 9am to 5pm, Monday through Friday. For more information about the Parks Department Art Program, visit its website or call (212) 360-8163.